The 2017 NASDAQ return was +27.24% calculated from the price index. Using a better calculation which factors in dividend reinvestment, the NASDAQ returned +28.62% in 2017. The above numbers assume you bought the NASDAQ index on January 3rd, 2017 and sold at close on December 29, 2017. The numbers for buying at the December 30, 2016 closing price are +28.24% and +29.64%, respectively. Traditionally, the NASDAQ has been a technology-heavy index. Further, technology companies have a growth bias and tend to pay out fewer dividends than other economic sectors. That important caveat aside, NASDAQ firms do pay dividends – depending on your choice of start date, reinvesting would have added around 1.4% to your annual return in 2017. That’s not nothing – 1.4% is an additional 74.4% over an average 40 year career. (As an aside, it’s also a reminder to minimize the fees you pay). Once again: dividends matter. Even with a tech-heavy index. These numbers come from NASDAQ Indexes. They also have a number of specialized indexes – biotechnology, big companies, and the like. No matter which starting date and price you preferred, it was a tremendous year for the NASDAQ. If you bought and held a fund investing in the index and held it last year, you would be up in the neighborhood of a 30% return. Of course, as we always say, your mileage may vary. Slippage, dividend timing, fees, purchase timing, and other factors would affect your final numbers. Still – it was a great year to be in the market. 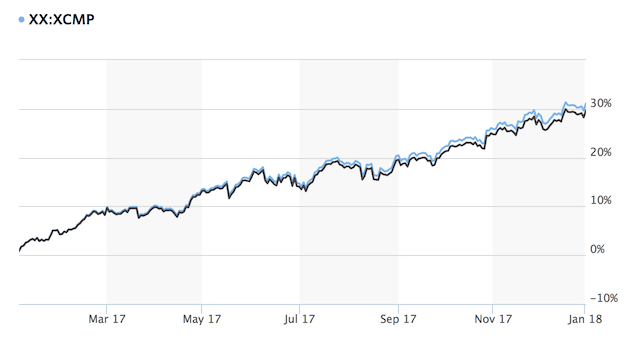 What do you see the NASDAQ doing in 2018? Want to predict a return? I really appreciate this one! I have quite a few friends who invest in tech heavily (same guys buy gold and bitcoin…), and they pretty much write off dividends as meaningless. I’ve tried time and time again to convince them that dividends (and trading costs) are a significant factor in long term investing, even when the quantities seem small. That 40 year total difference between portfolios really drives home the point! Thanks! The NASDAQ calculation is fun because people assume there are “no” dividends, but there are a decent amount paid out. I’ve got one or two more of these coming… but they’re more esoteric… or maybe funny? PK turns excessive caffeine into interesting posts, useful calculators, and interactive tools. We write posts and create calculators and visualizations to help you understand your finances and take control of your investments.